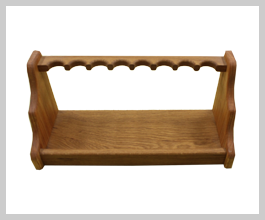 This solid oak or walnut pistol rack available in eight gun configurations conveniently fits on one of the shelves inside the safe to organize your handguns and provide more shelving space. This unique patent-pending handgun holder simply slides over any shelf to save space. Just slide barrel over exposed prong, can be mounted under shelf or on top. 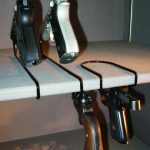 The handgun holder saves space, provides easy access, won’t slip off, holds two handguns, has protective rubber tips and a thick protective coating. 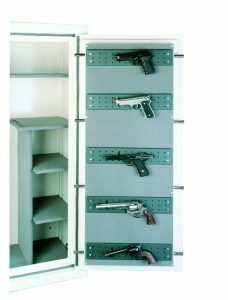 The handgun holder can also be used to hang other items out of the way in garages, closets, and cabinets.